Lets go through these points in turn below. Why is gym flooring for garages so dusty? If, like me, you work out in your garage you will likely be extra dusty! Garages rarely have good seals to prevent general dirt from blowing in under/around the door so debris from outside gets in. Unfortunately for many of us, we need to use our space for some other things too so dirt etc. accumulates from the lawn mower, garden tools, bbq’s and all sorts. Why is dust a problem? It can get in your eyes/nose and at worst affect your grip leading to drops. Not to mention it’s messy and can lead to getting an ear bashing from the other half! I have used some cheap iron Olympic weight plates when working out. If I was to deadlift the barbell with these and drop back to the ground even the most gentle return would create a huge noise on the concrete garage floor! I currently use some 18mm thick rubber flooring which dampens the noise to a far more acceptable level. Reducing the noise is a double positive as it also removes that little bit of subconscious restraint when lifting that the return needs to be dampened. This way you are focused on form and not on minimising noise. 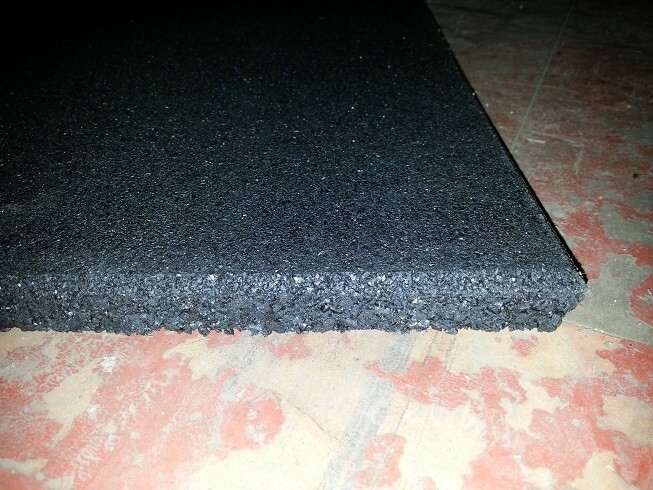 Moving on from the previous point on how rubber tiles will reduce noise, they will also protect your weight plates. You don’t need fancy rubber Olympic weights to be protective over them! Even cheap iron plates will chip and crack if constantly battered. Laying down a firm rubber base will give you a bit of damping between the iron plate and the concrete ground. While a hard rubber tile may not feel like it has much damping, when dropping 400lbs on it they squish just enough to take the edge off the drop, unlike concrete! What should I look for in garage gym flooring? NOT EVA – this is a very soft, foam type material. It is way too soft and doesn’t offer a sturdy enough base for standing on when doing big lifts. Look instead for hard rubber which will feel solid underfoot. Many suppliers will be cagey about the material, probably in a bid to sell you some sub-standard EVA tiles. The easiest way to tell if mats are any good is to check the weight. If 6 tiles weigh 2kg, avoid. If they weigh 6kg+ then they are likely the real deal. 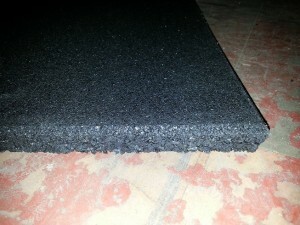 Thickness – I have 18mm thick crumbed rubber tiles in my garage. This is probably overkill, and I would recommend somewhere between 12-18mm. 18mm would give you more of a comfort margin. Watch for delivery charges, given how heavy flooring can end up being delivery can be a big sting in an otherwise cheap deal. Size – make sure and order enough to cover your workout area. I started with enough under my power cage which is c.2.5mx2m which is the minimum I would recommend. I’ve since expanded to cover the entire gym area in the garage. Most importantly, please check the weight of the gym flooring before ordering. It is much better to pay a little more to have something that’s up to the job. Horse stall mats make great gym floors! Stall matting is designed to take a 500kg horse stamping around on it for hours a day, not to mention tough enough to withstand being power washed and scrubbed clean daily. They are therefore more than durable enough to make a great base. Stable mats are readily available at equestrian suppliers. Google local suppliers or, if you prefer to order online, I’ve put a couple of links down below you can check out. These are available in 6ft x 4ft spec and are occasionally rebranded as garage or gym flooring which is fine. One thing – be warned these babies are heavy buggers! Great news once in place but means it’s probably a two person job to initially unroll. Can I find cheap flooring options in the UK and the USA? You sure can, I know as I bought cheap rubber tiles and use these in my garage here in the UK! If you’re not in a rush, one of the greatest sources of cheap gym flooring is online on the likes of ebay. What I would do if ordering again, is buy two stall mats and sit these side by side. This would give an area of 6ftx8ft which is ideal space for a power rack set up. For a few quid extra, for those in the UK, I would consider these as well which are a little thicker (18mm). I’m using 18mm mats at the moment and they really do take a beating!